Attending, from left, are Thomas Radcliffe, Denise Radcliffe, Cardington senior Branden Steckel and Bradley Steckel during Branden’s commitment to attend and play football at Heidelberg University. CARDINGTON — Branden Steckel wants to keep kicking. 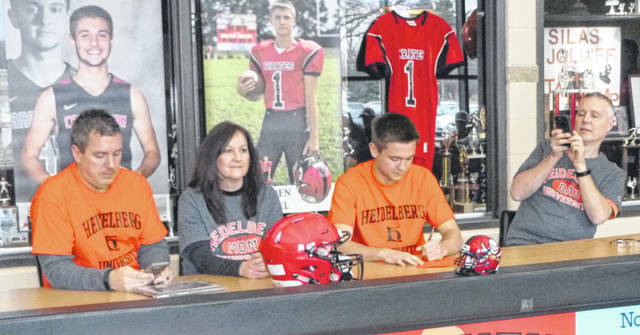 Steckel announced Thursday afternoon his plans to play football and continue his education at Heidelberg University in Tiffin. “Their kicker from last year graduated. So they told me I could get a starting spot if I tried very hard and go above and beyond,” Steckel said. The 5-11, 170-pounder was named All-Central District first-team kicker. He will kick and punt for the Student Princes. They compete in the tough Ohio Athletic Conference comprised of NCAA Division III schools, including John Carroll, Baldwin Wallace, Marietta, Ohio Northern, Capital and Otterbein. Steckel won 4 letters in football, 2 in basketball and 1 in track at Cardington-Lincoln High School. Pirates head football coach Tim Plumley said Steckel earned the Golden Helmet Award and the 38-Point Award for academic and athletic achievement. “Branden does things the right way. Being a first-year coach here it was important to have players like Branden in the program,” Plumley said. Plumley pointed to Steckel’s 40-yard interception return as a turning point in the victory over Mount Gilead last fall. Steckel started out as a soccer player. “My freshman year Jerry Williams, our old football coach, asked if I wanted to kick for them. So I went on the field with a ball and a tee and I started kicking,” he said. Kicking can be a solitary exercise and one that requires mental discipline. Steckel plans to study business at Heidelberg.